If you are like most residents in Tampa, Florida, you do not put a lot of dependability on a furnace to maintain indoor comfort. While there are some days where it gets a bit chilly, Florida’s mild and balmy weather is one of the main reasons why living here is so popular! Ideally, you want to keep your home comfortable throughout the year, whether the outside temperatures are mild or cooler. For that reason, you may want to consider heat pump installation from a professional HVAC company. Many people are unaware that a heat pump has the ability to transfer three times the warmth that the total amount of energy it uses. 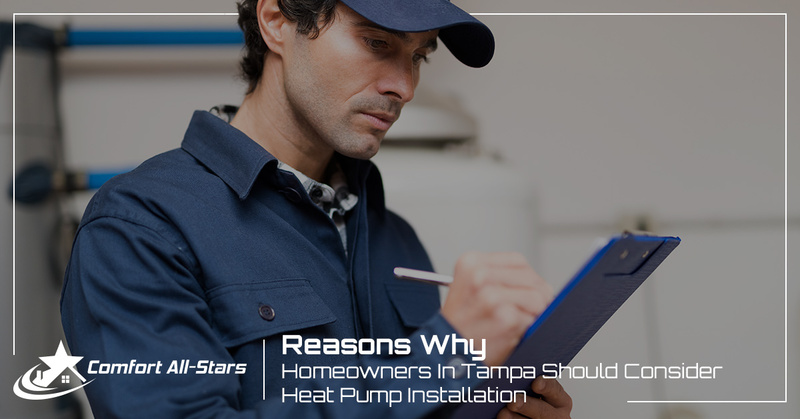 Indeed, heat pump installations in Tampa can help residents keep their home warmer during the winter months and cooler during those hot and humid summer months. While there are a variety of different types available, all heat pumps typically function the same. Instead of transferring burning fuel, heat pumps transfer, well, heat. By transferring air from one location to another, heat pumps only require a minimal amount of energy to cool and heat your home. Similar to how a refrigerator works, a heat pump takes the heat from the outside air and pumps it through the refrigerant-filled coils in the winter. When temperatures increase, heat pumps work in reverse, removing hot air inside in your home and transferring it outdoors. Heat pumps enable you to heat and cool specific rooms and areas throughout your home. Ductless heat pump installations typically come with a single outdoor unit and typically up to four indoor units, each with temperature-controlled thermostats. Plus, in addition to increasing your home’s energy efficiency, you’re also able to achieve and maintain comfortable temperatures in the rooms where you spend most of your time. If you live in Tampa, heat pumps are a great option. They aren’t suited to climates with harsh and extremely cold winters because they can have difficulty operating efficiently. Heat pumps are a cost-effective alternative when compared to traditional HVAC units. They provide reliable heating and cooling without breaking energy-efficiency. If you are currently looking to replace your old or worn HVAC system, heat pump installation can change the way you think about your heating and cooling needs. If you are interested in learning more about heat pumps, contact the team at Comfort All-Stars! We can help you find the perfect heating and cooling solutions. Do you already have a heat pump? We offer heat pump maintenance! Our team can check and swap out the filters, clean the condenser coils, and take other necessary measurements to ensure that your system is working efficiently.